RealFlow 2015 now comes with OpenVDB meshing by default for both Particles and Hybrido fluids solutions. With OpenVDB meshing, users can now get faster results and, with the new volume filters, fine tuning the look of the meshes becomes even easier than before. The New crown daemon adds a very fast and easy way of creating a highly demanded fluid effect. With just a few steps, users can define the shape of the splash crown they want to create, and the fluid will follow that shape, when it gets activated, and for the time the user decides the force to have an effect. With the additions of Daemons Falloff controls, the users now have the power to shape, even more artistically, how the forces affect the RealFlow simulations. Thanks to the enhancements to the user interface, controls such as spline curves are now possible to drive highly detailed effects. A new Tool for creating text has also been added and appears in two different locations in the shelves. In the splines shelf the text tool allows for creating splines emitters and forces and in the Objects Shelf, the text tool generates text as native RealFlow primitive objects. The RealFlow interface comes packed with loads of new enhancements in this 2015 version, making it more artist friendly. The Relationship Editor now has a much more compact look, to optimize space, and also shows the nodes icons, adding visual clues that speed up interaction. The Nodes panel includes a new section of one-click buttons to deal with bread and butter node actions such as simulation status, files export, visibility and shading, making common workflows faster and more intuitive. In the Parameters section we will find a massive revamp. Sliders, value changes with the middle mouse button, Curve and Ramp widgets, and the ability to keyframe with a single click, lock parameters and enter expressions very easily. Users can now add notes to any node too. Nodes with editable parameters, such as the new spline curves, now display visual clues on the viewport to help guide the user on how to start using the features. 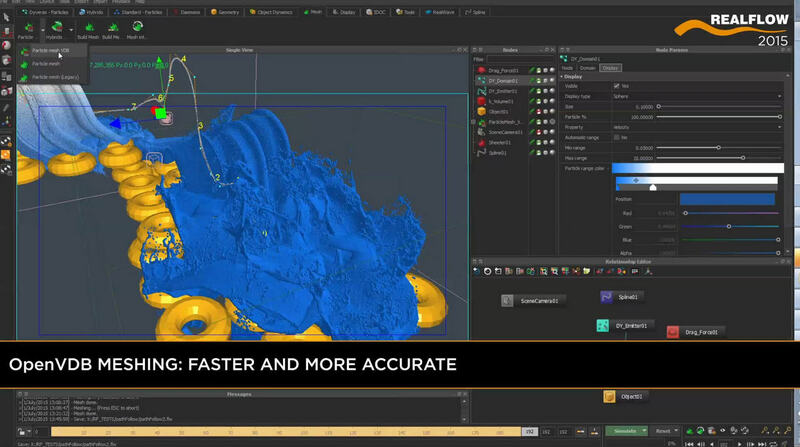 RealFlow 2015 Dyverso solvers offer a huge speed up on small to medium scale simulations. These solvers have been rewritten from scratch and with GPU in mind to take advantage of new hardware options. Scenes that with previous RealFlow versions might have taken hours can now be simulated in a matter of minutes.